You'll be £13.50 closer to your next £10.00 credit when you purchase Flight Craft 14: Messerschmitt Bf109. What's this? Order within the next 2 hours, 41 minutes to get your order processed the next working day! The famous Messerschmitt Bf 109 single-seat fighter was one of the most important warplanes of the Second World War. Originally designed during the 1930s, and a contemporary of the equally-legendary Supermarine Spitfire, it was vitally important to Germany’s Luftwaffe and was flown in combat by the highest-scoring fighter pilots in history. It was in service throughout the Second World War and was built in a number of significant versions that proved to be worthy adversaries of the very best of the Allied warplanes that it flew against. Bf 109s operated in all the major areas of conflict where German forces were engaged in combat and, in modified form, the type even had a post-war career in several countries that extended well into the 1950s. First-class documentation for model airplanes and historians and investigators on the air war during the Second World War. The reviews are all well written and accompanied by images of some beautifully built offerings which should provide plenty of inspiration for any scale modeller. 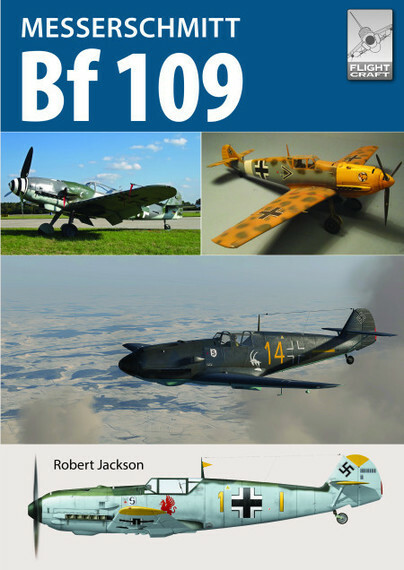 Overall this is another great title in the Flight Craft series and if anything was going to make you want to pick up a 109 kit from the local hobby store, or dig one out from your stash, it’s this book. Like the Spitfire, the Bf 109 is an iconic fighter of WWII and it has encouraged many plastic and resin kits over the years. Many are no longer available, or are difficult to find. This book provides a very good set of reviews of those kits still likely to be available and of enhancement products that turn a good kit from a nice model into a competition grade replica. There are lots of beautifully finished models shown here, and a final section of 'Modellers' Showcase' with more very nice larger scale kits. Add the model information to the basic history behind the fame and widespread use of the 109 which makes it an excellent basic groundwork for the modeller, a well balanced and useful addition to the FlightCraft series.